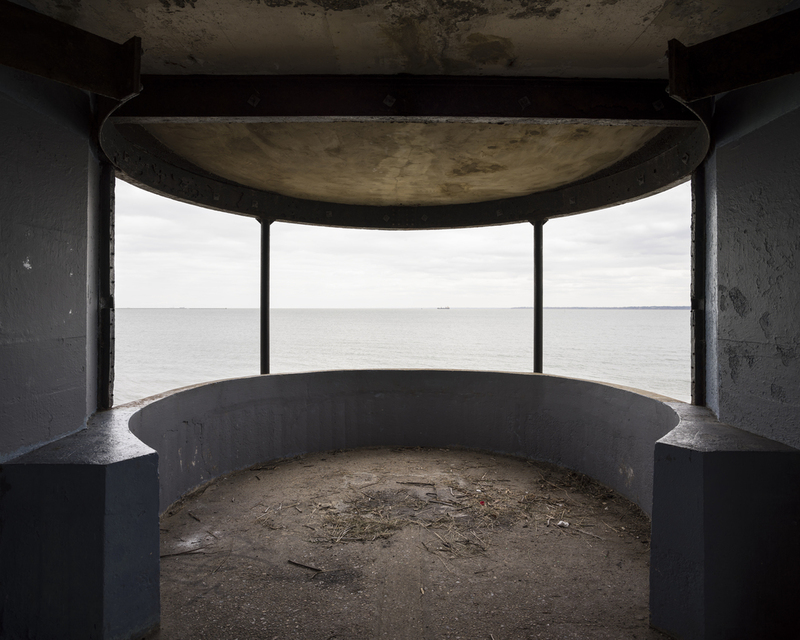 Alia Syed, Observation Post, 2018, pigment print on Hahnemuhle paper, 58 x 72". Sinuating ripples along a shoreline, the sound of waves—one cannot underestimate the calming effect certain kinds of landscape have on the psyche. However, in Alia Syed’s work Meta Incognita: Missive II (2018)—the second in a trio of roman à clef–style films whose themes center around the River Thames in England—all is not what it seems. The narrative is built upon the exploits of the Englishman Martin Frobisher, a “licensed pirate” of the sixteenth century who tried to locate a path to Asia through the Northwest Passage. (The Latin title of the work translates to “Unknown Limit”—one can’t help but align its meaning with a particular strain of colonialist greed and despoilment.) With hypnotic shots of the sea and a subdued palette, Syed’s film forebodes a dystopian future that feels considerably more foreseeable than we care to imagine. Here, the shore is occupied by QinetiQ, a real-life British arms manufacturer. The film, just shy of an hour long, sets off at dawn and ends at dusk—the horizon line slices through the screen. We are anchored to our surroundings by the relentless sounds of water mixing with rising winds. Every few minutes the voice of a fictional female character, a defecting ship’s captain, traveling from the Arctic to England—one of Frobisher’s routes—tells us a story that’s constructed from interviews Syed conducted with the few remaining inhabitants of the site QinetiQ has taken over. Elsewhere in the gallery are photographs of the desolate shore. One, titled Observation Post, 2018, seemingly taken from some manner of tower cockpit, has a strongly panoptic quality. Syed’s exhibition—steeped in tales of falling empires and dread—sees a little too clearly into tomorrow.